I've never been particularly good at arcade games. Fighters, Shooting Games, whatever. Equally lousy at all of them. I have been fascinated with arcade hardware though, and have wanted for a very long time to have a true-to-orginal-parts way of playing arcade stuff in my own house. I've modified MadCatz and Hori sticks in the past, and experienced both IL (Happ) and Japanese style levers and buttons. Practically speaking, American style cabinets are huge, heavy Medium Density Fiberboard monsters; impossible to fit in a New York apartment without seriously angering your significant other. 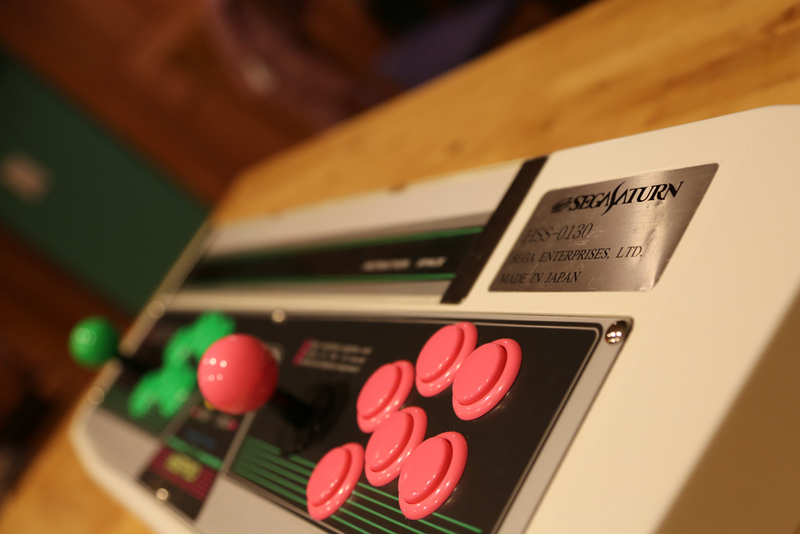 Japanese style cabinets are a lot smaller, welcome seated play, and generally have nicer feeling buttons and sticks. Having played both, I really prefer the Japanese machines made by Sega; they're wonderfully designed and supremely responsive. Finding an Astro City cabinet on the other side of the world though, that's not an easy thing to do. 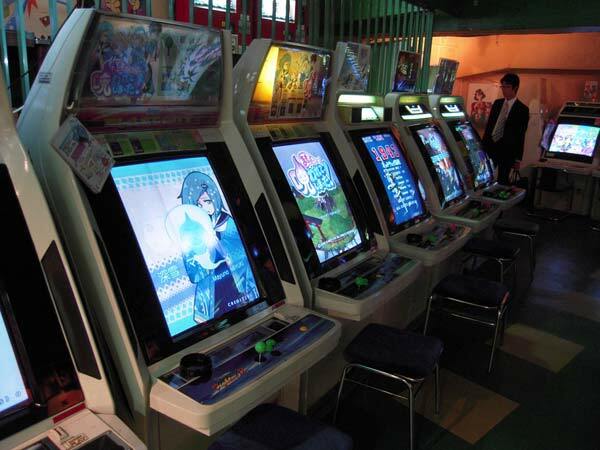 A Japanese Arcade; photo credit unknown. Besides, it's still a huge box living in your house that will generally only play a couple of games at any given time. 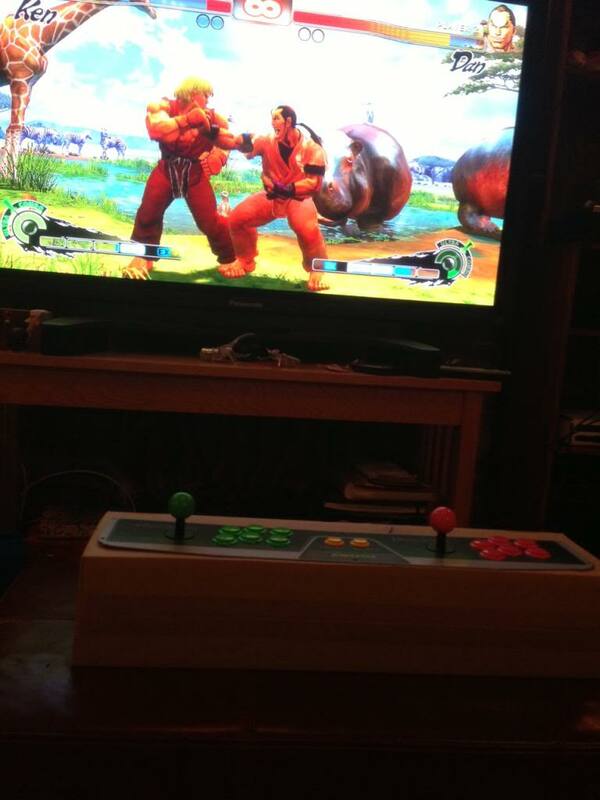 Hard to bring your nice sticks over to a buddy's place, and don't you want to use them with Street Fighter IV on your big TV? Heck, that monitor's also got a shelf life and is probably in need of repair anyway. What's the alternative if you want something that looks and feels like an Astro Panel without the cabinet? Well, buying the actual metal plate that you'd use in an Astro City arcade system is a pretty good start. Sanwa, makers of fine levers and buttons, manufactures a plate licensed by Sega as a replacement part. The sticks are standard JLF (square gated) and the buttons are supremely awesome OBSF-30RG switches. These are a little longer and more durable than the standard OBSF-30 buttons you'd get in most arcade sticks today. The little breakout box on the left is for the Neo Geo connection. Wiring the plate to a Multi-Console comes next. The Cthulhu MC works great, and supports nearly any system you want out of the box... except for the 360. You'll need to get a different PCB, or spend a little more time setting up other stuff. I'm not sure why Dan's winning here. The panel feels great, but a cardboard box isn't exactly the best housing for such a fine piece of gaming hardware. Building a box is one solution, but there are great alternatives if we're willing to search on Yahoo Auctions Japan. This particular panel came with the 100Y sticker covered with a 50Y sticker. Must not have been a very good game. Eventually, I found an actual chunk of an Astro City Machine. It ran about $15, but cost $60 to ship to the states. Cigarette burns, gum, other mysterious substances... expect to do a lot of cleaning. The plastic was miraculously white though, and seemed to be incredibly durable. These panels show up with some frequency on Yahoo Auctions Japan, but you'll need someone to purchase it for you unless you live there. I use Buyee.jp, but there are probably other options. Buyee generally charges you a fee on each item you win, but is great at communicating with sellers on the other end of things. My arcade nook. 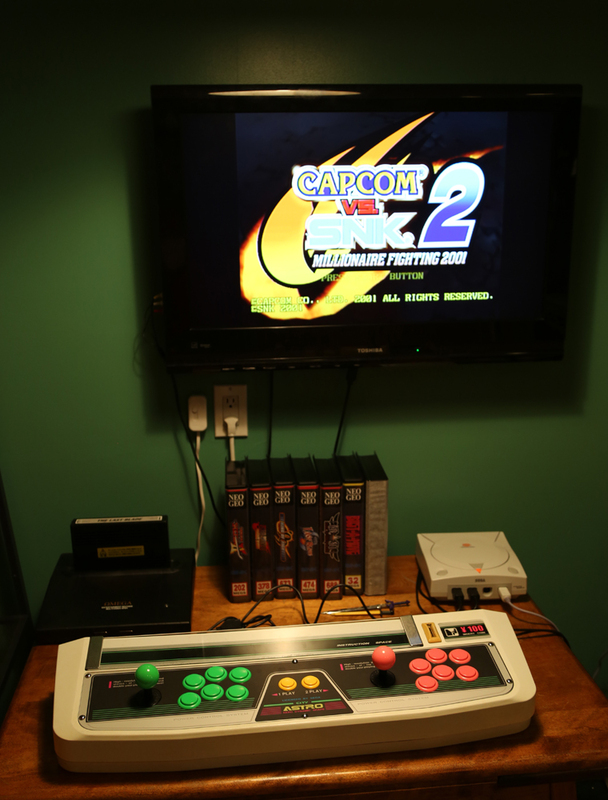 It now features a Saturn between the Neo Geo and the Dreamcast. While this setup worked well, it isn't exactly portable, or even nice looking from the reverse. The back is entirely open, and would require some serious work to cover. These things actually have glass covering the instruction area. While there are other arcade panel pieces that don't require a hacksaw to remove from machines (Blast City machines have removable control sections), the best option by far is to hunt down a Sega Saturn HSS-0130. Unlike its arcade cousin, thinner plexi-glass covers the HSS-0130 instruction area. The HSS-0130 was a Japan only accessory for a system that did very poorly in the USA; the infamous Sega Saturn. The Saturn in Japan managed to garner quite a following though, due in no small part to its reputation as a 2D powerhouse that gave a home to many fantastic arcade ports. While the HSS-0130 levers are wonderful Seimitsu parts, the weird 8-button version of the Astro layout is made of low-quality knockoff buttons. Who knows why Sega didn't go all the way here... kind of lousy for a "pro-grade" $300 accessory. Even lousier when you consider the $300-$400 prices that these get today on eBay or YAJ. Fortunately for me, some careful hunting revealed an HSS-0130 that no sensible human would buy. The original owner had modified the sticks to work with his Dreamcast, but done a terrible job... the auction specifically stated that only "Someone with soldering experience" should buy it. Oh, and the original plate had rusted. Badly. So badly that he sold it for only $90. After cutting holes, using near gallons of plastic refinishers, and completely installing everything, it was finished. Who knows how it got those dents in the metal plate. They're the only things I couldn't buff out. The stick has DB-15 ports to connect with Neo Geo hardware (I use a consolized MVS) and RJ-45 network jacks to connect to nearly everything else. Extra buttons added for home / select on the reverse. 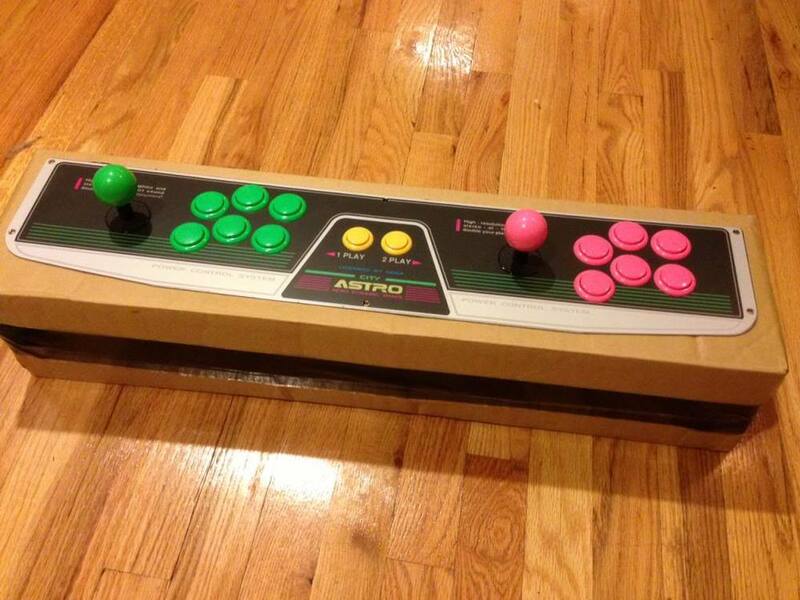 So there it is; a stick that will work with nearly anything, and feel just like a Japanese arcade unit. What did this project teach me? Despite the "Japanese Arcade Quality" advertised on most fight sticks these days, actual arcade panels use longer buttons with better switches. Patience is a virtue when looking for this kind of hardware. It's never tricky to find something like an HSS-0103... but that's only if you're willing to throw tons of money at something that will likely require a complete overhaul. If your HSS doesn't come rusted, you CAN swap the buttons if you have appropriate sized snap-ins though. Make friends with a network engineer of some kind. Someone who is a wizard with network cables is a definite plus... I'm still pretty slow at making my own system cables for the RJ45 jacks. Classic Gaming hardware, photo junk, whatever strikes me as interesting at the moment. 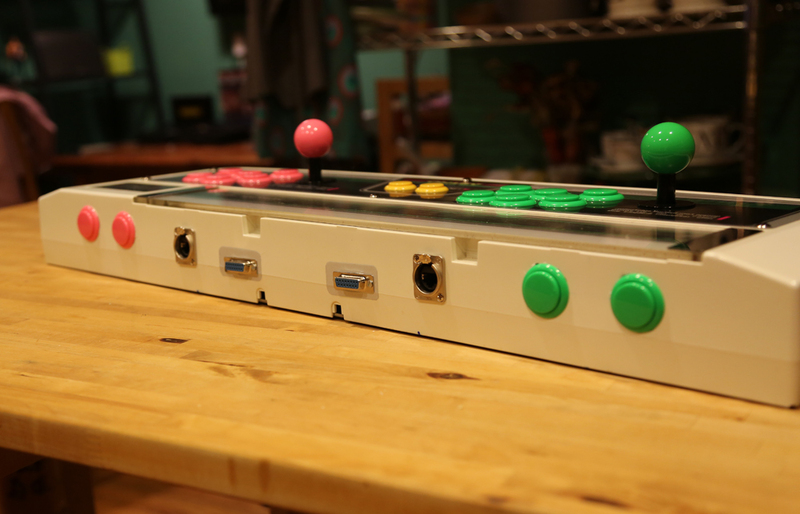 Got a cool arcade hardware project you'd like some help with, or want me to build you a cool set of sticks? Send me an email at dapietri@gmail.com!